Peanut butter is a nutrient-rich, calorie-dense food that can be a healthy addition to nearly any diet. As with all foods, though, peanut butter isn't perfect for all situations. While peanut butter can help you bulk up when attempting to gain muscle, using peanut butter as a pre-workout meal isn't ideal. Peanut butter's nutritional profile contains nutrients that may hinder exercise performance, but you may experience different results, so see what works best for you. Peanut butter is mostly known for being high in fat; each 2 tbsp. serving provides 16 g of fat. While your body needs dietary fat -- particularly the unsaturated fats that peanut butter provides -- fat isn't the most efficient source of fuel, as it takes a long time to digest. Consuming high-fat meals prior to exercise can cause cramps and may feel heavy in your stomach. Carbohydrates are your body's primary source of energy, so it's important to consume enough of them to fuel your activities. Peanut butter is high in calories but very low in carbohydrates, with just 8 g in each 2 tbsp. serving. In addition to providing energy, carbohydrates can help maintain your hormone levels; a study from the April 2010 edition of the European Journal of Applied Physiology found that pairing intensive training with a low-carbohydrate diet resulted in a reduction in testosterone levels. 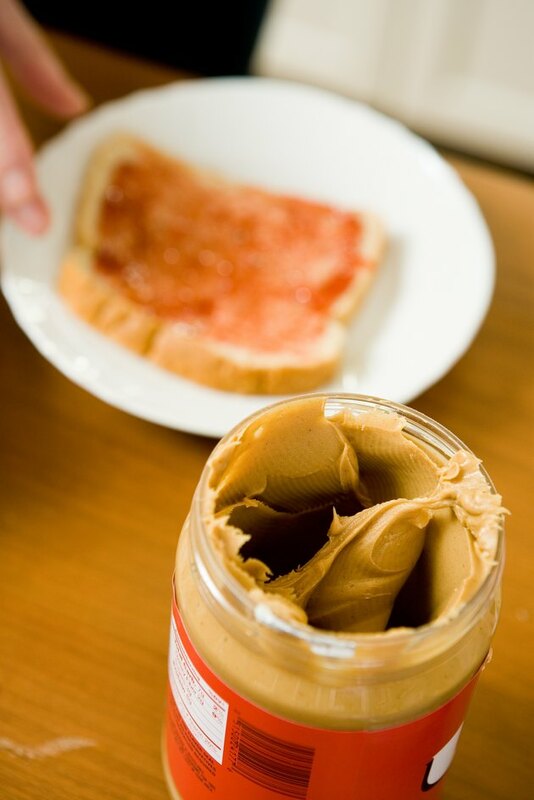 One benefit of eating peanut butter before exercise is that it's low in sugar. A 2 tbsp. serving of peanut butter contains just 2 g of sugar. While sugar does provide energy, it's also absorbed quickly and tends to cause an energy crash shortly thereafter. High amounts of sugar also can upset your stomach. Peanut butter isn't a rich source of potassium, with 189 mg in each 2 tbsp. serving. That amount comprises less than 10 percent of the daily suggested intake of 2,000 mg and is slightly more than half of what a 100 g banana -- which is higher in carbohydrates and lower in calories, with 89 -- provides. Potassium is an important nutrient for exercise performance, as it helps control nerve and muscle function, and you lose it through sweat. Peanut butter also lacks vitamin C, an important nutrient that your body uses to make collagen, a structural component of bones, ligaments and other connective tissue. In addition, research from the June 2005 issue of the Journal of the American College of Nutrition indicates that increased vitamin C intake can promote improved fat burn during exercise.